It's week 15 of IPC's 1979 Star Guest promotion so attention turns once again to Whizzer and Chips. Who has been chosen to represent Cheeky Weekly this time? As you can see, this week it's the toothy funster himself who has been tasked with publicising his own comic. 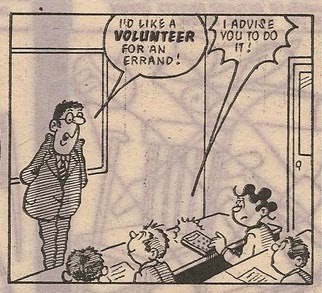 This isn't the first time our grinning pal has appeared as the subject of a Star Guest strip - it's the 4th.. 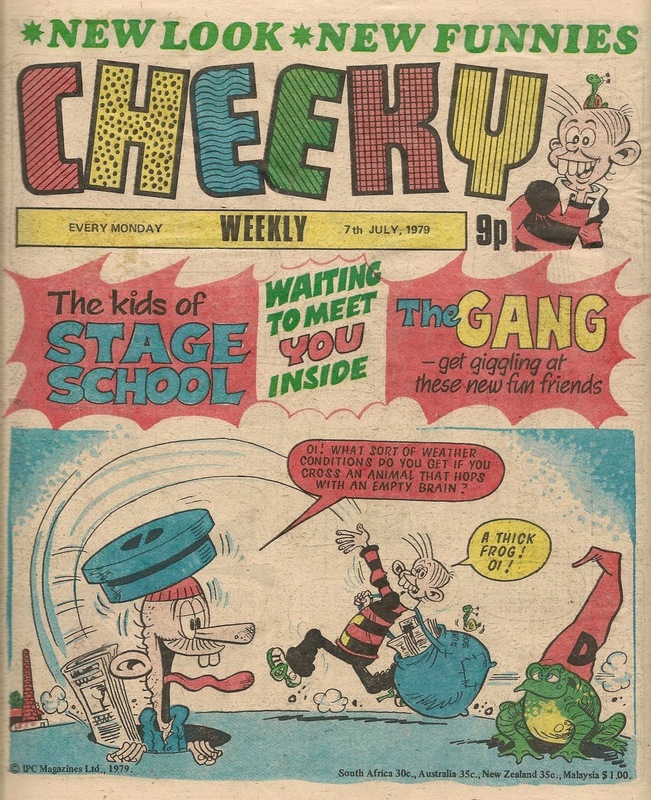 He's appeared twice previously as Cheeky Weekly's ambassador to Whoopee (here and here), and once within Whizzer and Chips. However, this is the first time that a Cheeky Star Guest has been drawn by Frank McDiarmid. But hold on - can it strictly be said that Frank has drawn this Star Guest? 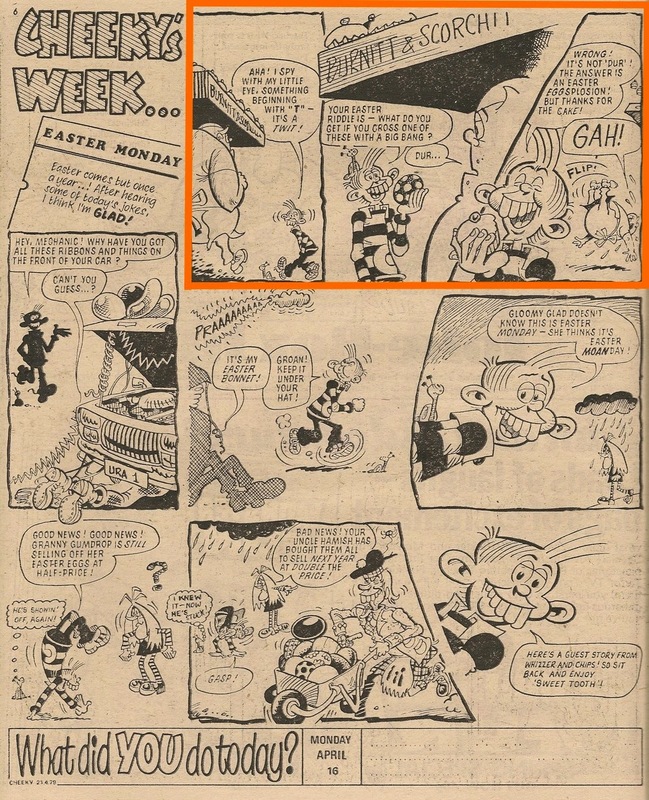 In fact the artwork has been constructed from elements that originally appeared in the 21 April 1979 Easter issue of Cheeky Weekly, but different dialogue has been applied to the speech balloons. Anyway, it's good that Whizzer and Chips readers finally get exposed to Frank's version of Cheeky. Any who opt to subscribe to the toothy funster's comic as from this week will find that the title is sporting a new look (although they of course won't be aware what the old look was) and they'll be able to enjoy 31 issues before Cheeky Weekly succumbs to the customary fate of underperforming comics and gets absorbed into a more successful stablemate (in this case, Whoopee). Cheeky Weekly Cover Date 07 July 1979 - the New Look! Here it is – the much-vaunted (well slightly-vaunted in last week's comic, anyway) 'new look' issue. The cover doesn't have an exceptionally new look about it, apart from the legend 'New Look * New Funnies' at the top of the page. Below the comic title (the style of which hasn't been refashioned) are teasers as to the nature of our 'new fun friends' (although one story will turn out to be not so new). The Cheeky's Week...Sunday cover strip has been dispensed with in favour of a single-panel gag but despite the overhaul, the inimitable Cheeky/Manhole Man double-act return to the front page to make their 20th appearance on page 1. Turning to page 2 we see that Sunday is still featuring Cheeky's paper round but there is a change in the layout as the What did YOU do today? 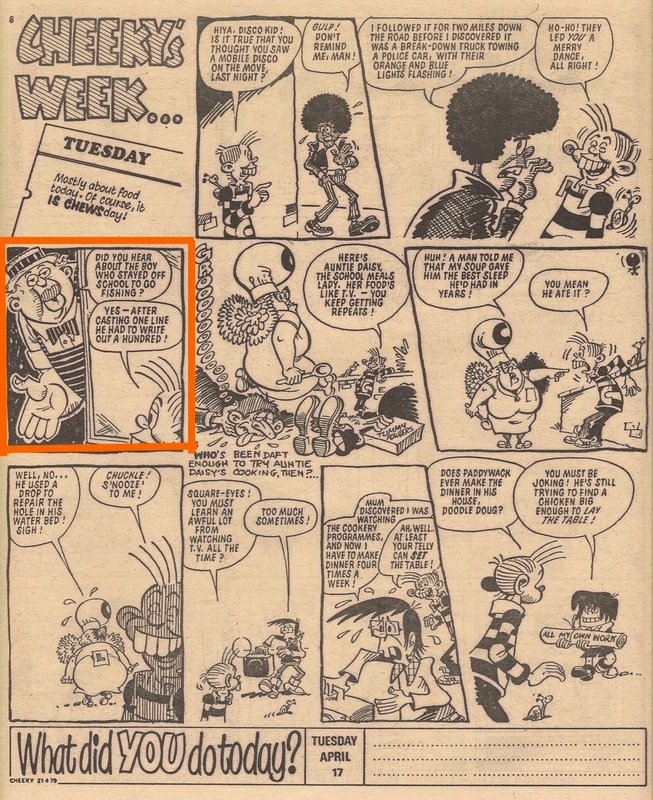 section at the foot of the page, introduced into the Cheeky's Week features way back in the 30 September 1978 issue, is absent. 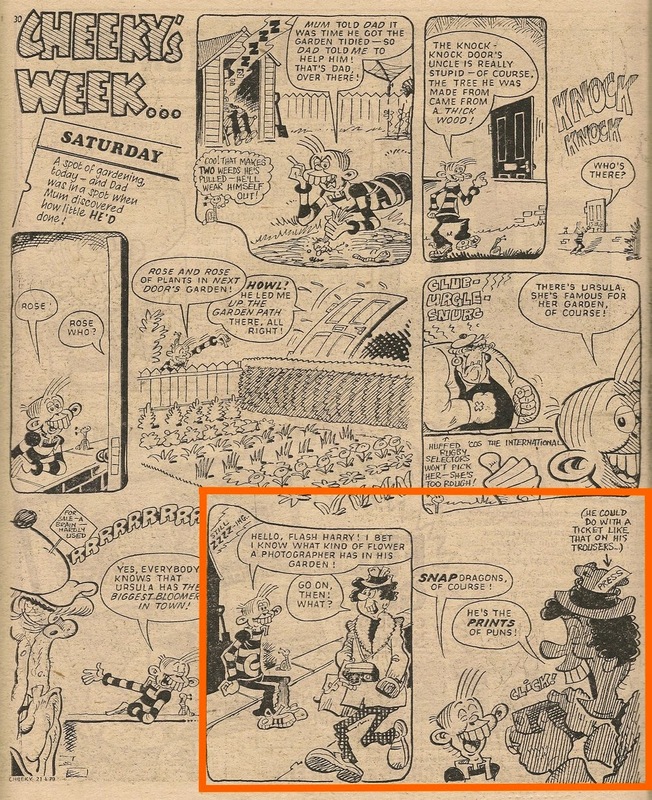 The different style of lettering in Cheeky's speech bubble in the final panel suggests that the original text has been altered for some reason (we've seen this on a number of occasions before). Maybe in this case Cheeky originally introduced 6 Million Dollar Gran. However, page 3 reveals Calculator Kid has survived the revamp, as he enjoys a day's fishing with help from his battery-powered buddy. Also unscathed is What's New Kids which follows Charlie and Calc. Any readers worried that Gran had been dropped from the comic will be relieved to see her commence a 3-page adventure on page 5, following which Cheeky and pals enjoy a titter-packed Monday. Further chuckles (some of dubious taste) follow in the form of stalwart feature Joke-Box Jury. After a chortlesome Tuesday with our toothy pal, Disaster Des proves he didn't suffer the ultimate disaster that can befall characters at the time of a revamp, by appearing on page 13. However, Des is normally confined within the Mystery Comic which has traditionally appeared after Cheeky's Wednesday page, so something's afoot. We then encounter the second of our new groups of pals, the showbiz wannabe kids of Stage School. Following this new strip by Robert Nixon is a Cheeky Weekly stalwart by the same artist - Elephant, who is still running and enjoying an adventure in the centre pages. This is the second erstwhile Mystery Comic strip which has turned up before we've even seen the cover of that perplexing publication. 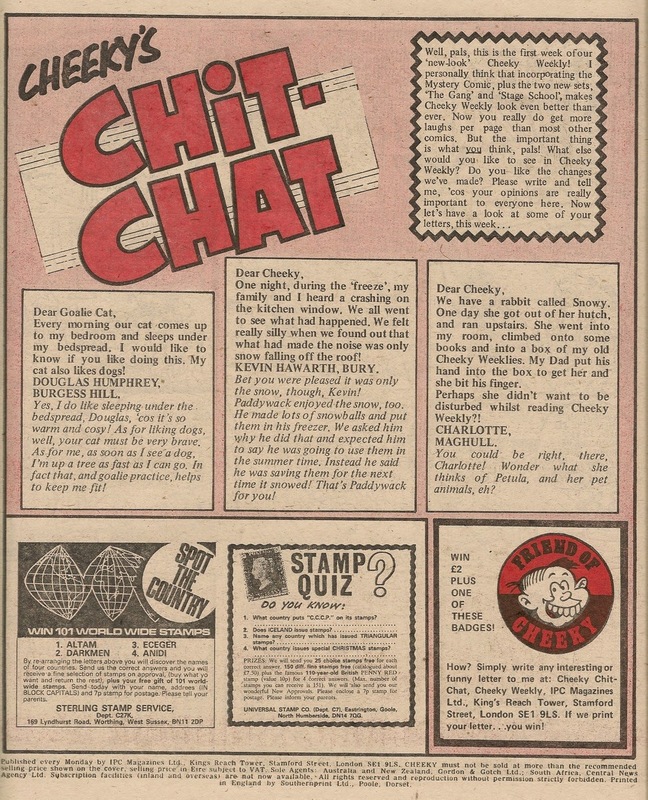 We then witness the Wednesday element of Cheeky's Week, but there's no introduction to the Mystery Comic in the final panel as there has been every week since the comic dated 30 September 1978. However, the Mystery Comic's ongoing serial Mystery Boy continues on page 19, following which is a selection of Paddywack gags. 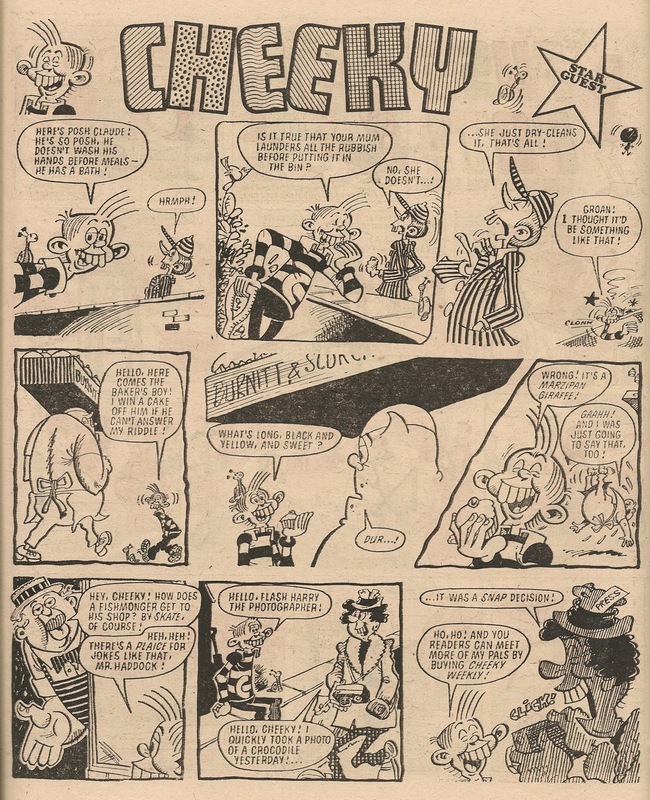 Our toothy pal returns on page 22 with Thursday's collection of corny quips, and then we discover that the Star Guest promotion continues despite the revamp, as Cheeky Weekly is paid a prank-packed visit from Whizzer and Chips' resident japester, Joker. On the Chit-Chat page, Cheeky solicits reader opinion on the new look explaining, as we have come to suspect, that the Mystery Comic characters have been assimilated into the main comic. Overleaf we share Friday with the toothy funster, then there's picnic fun with Mustapha Million, followed by high-velocity humour at the zoo with Speed Squad. A back cover ad for Mr Bellamy's Liquorice Novelties brings this revamp issue to a conclusion. 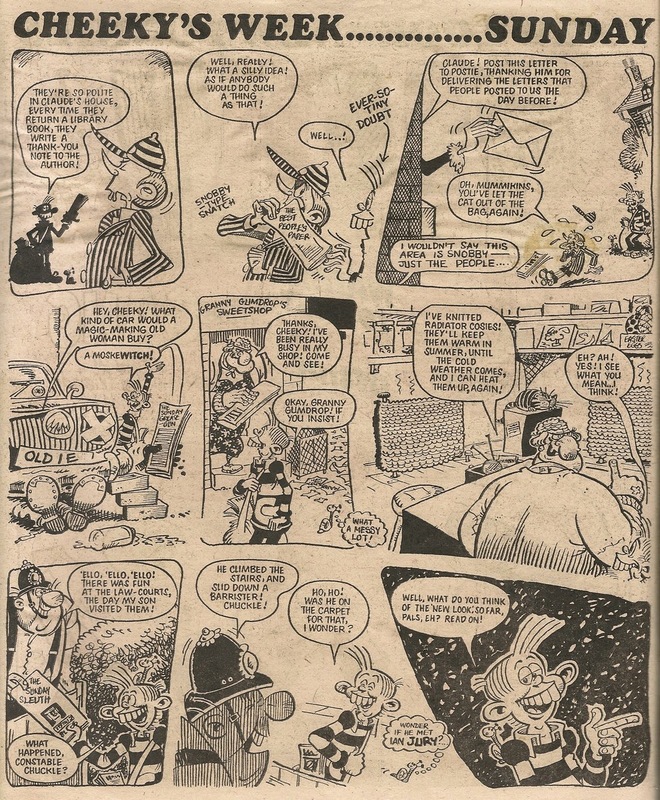 The Burpo Special which had become something of a fixture on the back cover, occupying page 32 for 12 out of the last 13 issues. Adventure/competition feature Menace of the Alpha Man which reached its conclusion last week. 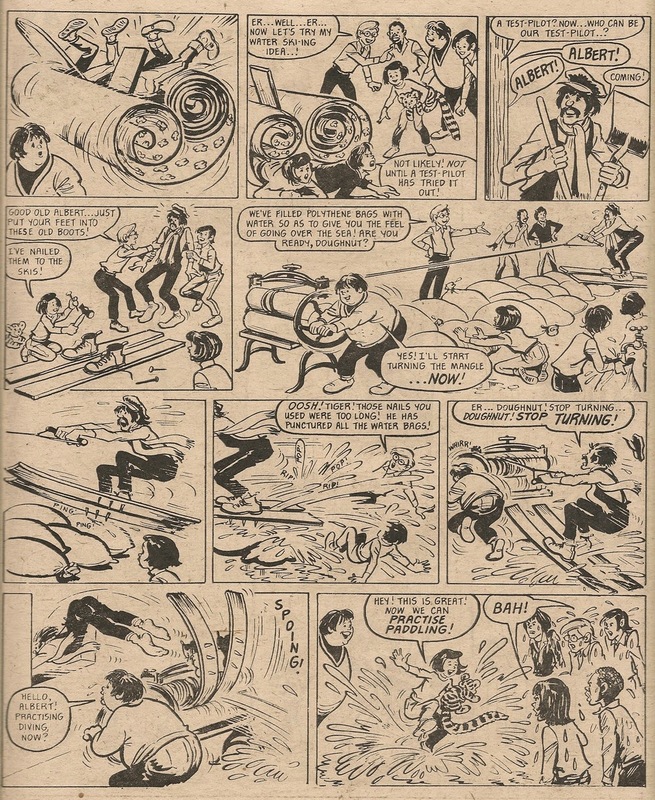 Despite losing the Mystery Comic as a grouping of strips in the middle pages, all the former MC features continue (despite not appearing this week, Why, Dad, Why? will return). 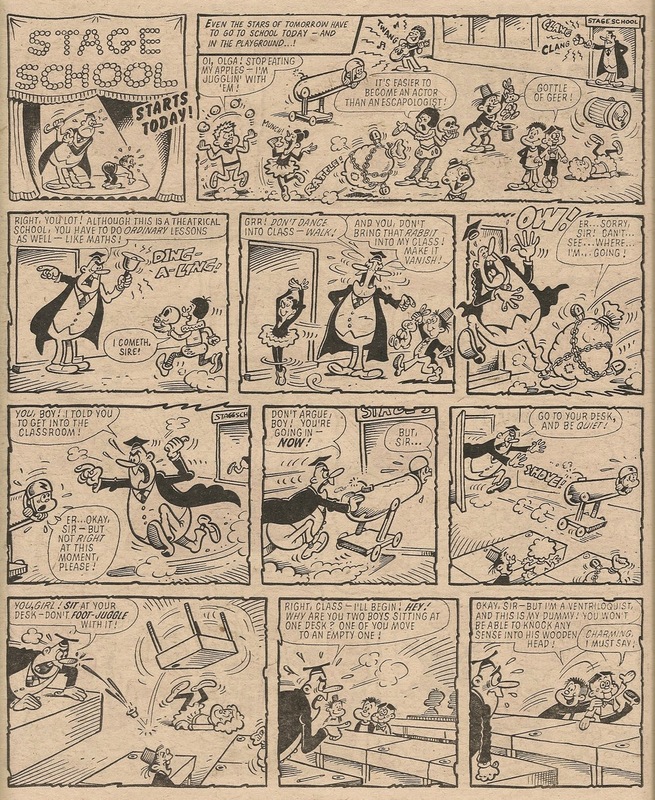 Having lost the Mystery Comic we have also lost the last remaining link between the Cheeky's Week strips and the other features in the comic - remember when the comic started all the non-Cheeky strips were in some way linked to the toothy funster's world. Thus James Bold was a story that Cheeky read (later a film series), 6 Million Dollar Gran was a TV show he watched, Home Movie was a film made by Oscar etc). Now we have no such linked stories (although Snail of the Century which will start next week, starring as it does Cheeky's sidekick, will become the sole direct connection although not 'framed' by the Cheeky's Week strips as were the original linked stories). We have of course gained 2 'new' strips, one of which is in fact being recycled. Another change is the loss of the introductory panel and What did YOU do today? 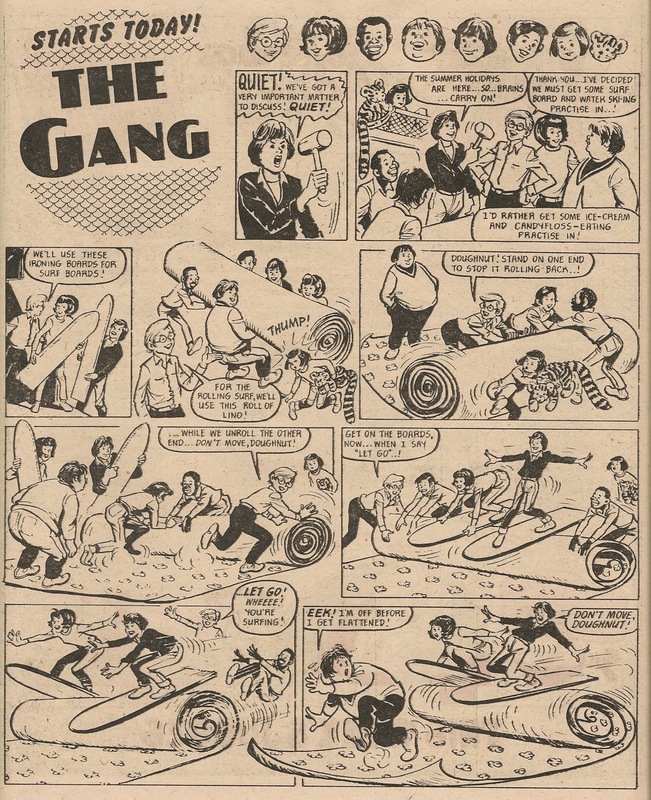 sections from the Cheeky's Week pages. The remaining framing devices have also been dispensed with. Frank McDiarmid delivers all 8 Cheeky's Week elements in this issue. 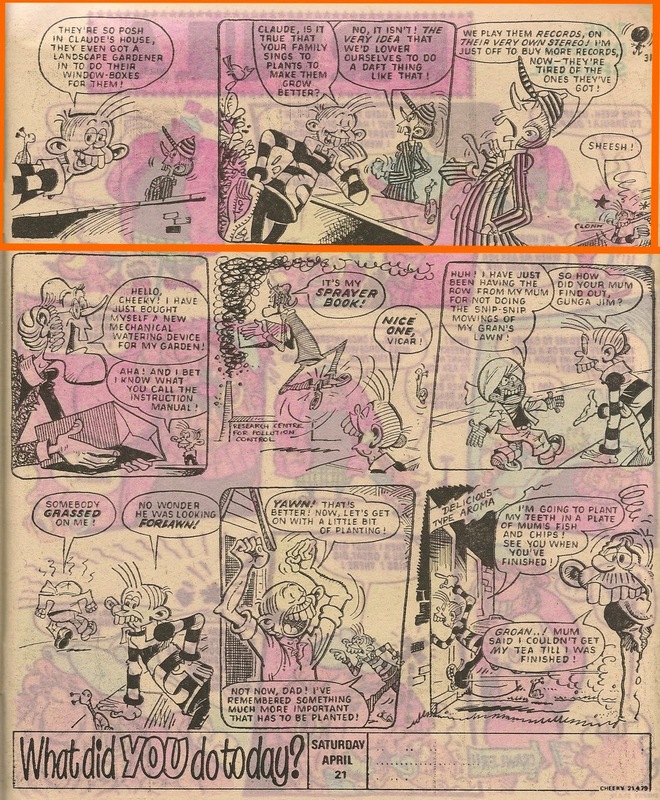 Peter 'Cheeky' Gray has posted the first 3 'Ello It's Cheeky strips from Krazy. 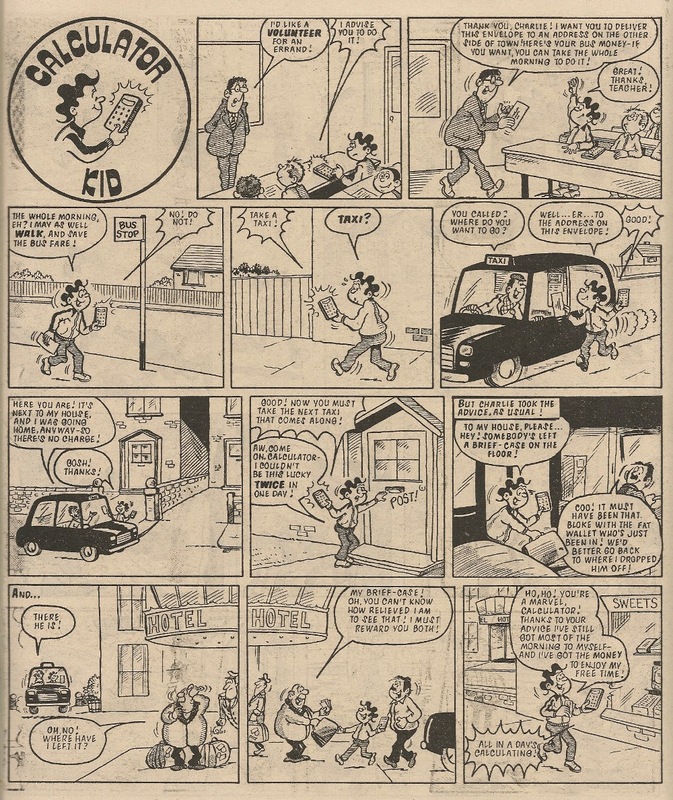 As Peter mentions in his post, it's interesting to compare Frank McDiarmid's early Cheeky work with his later strips in Cheeky Weekly. ... as with the raid covered in the previous post in this series, this was a Bave-on-Bave incursion, the interloper this time being Toy Boy. Our Cheeky Weekly pals are now falling rather behind, having suffered 5 raids while perpetrating only 3.